The name rabaab, (also spelt rubab or rebab) can refer to several roughly similar string instruments. The rabaab is a leading instrument in the music of the Arabs and is played all over the Middle East and North Africa. It gets its name from the Arabic word which means “played with a bow” and, confusingly, often also serves as a generic terms for any string instrument played with a bow. But the rabaab played in central Asia, where the instrument is the mainstay of Pashtun, Tajik, Turkish, Kashmiri, Baluch and Iranian Kurdish classical musicians, is always plucked rather than played with a bow and often has an entirely different construction to the one played in Arab countries. References to the rabaab begin to appear in Persian writings from around the 7th Century onwards and, in later years, notably in the works of Persian Sufi (Islamic mystic) poets. The rabaab also appears to have exercised a very considerable influence on the history of stringed instruments in Europe, and is thought by many to have been the means through which the bow was introduced to the West, with some musicologists suggesting that it was a direct antecedent of the violin. The North Indian version of the rabaab is known as the senia rabaab, (named after the Mughal court musician Tansen,) and its exponents are known as rabaabiya[s], an important category of musician in the Sikh religion with the word often being added at the end of the musicians’ name. The rabaab became a vital instrument in the accompaniment of Punjabi-Sikh devotional hymns ever since the time of Guru Nanak, (1459 – 1539) founder of the Sikh religion, after he had acquired his first disciple, Mardana, (1459 – 1519) a Muslim-Sufi musician who played this instrument. According to some sources, the Indian rabaab may well have developed independently of the Central Asian one and could just as easily have been a modified version of an older Indian string instrument. This essentially North Indian version of the rabaab which is unfretted, consists of a piece of hollowed-out wood at the top end with a hollow, circular belly also made of wood and covered with a sheep skin at the other end. The instrument has two bridges with one placed in the middle and the other at the tip. The two bridges support six strings made from gut which can be manipulated by six pegs at the top. The strings are played with a triangular-shaped plectrum, usually made of wood. Some rabaabs also have a wooden tumba (gourd) at the top end. 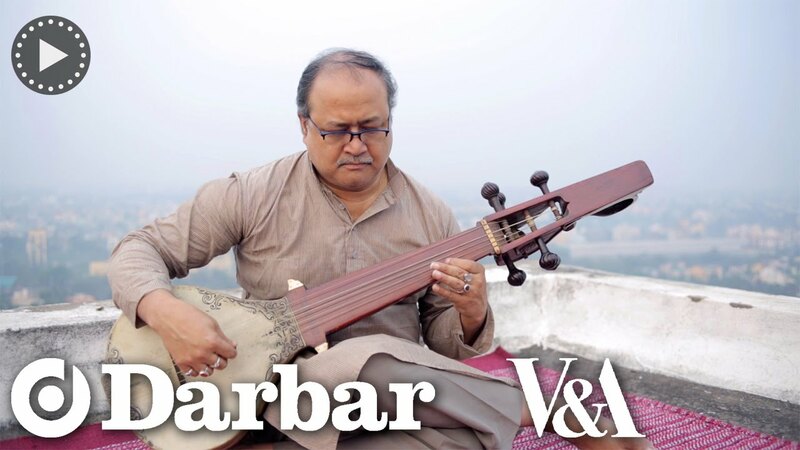 The rabaab was at its zenith during the 16th Century and also beginning to appear in recitals of North Indian classical music alongside the ancient rudra bin (veena). Some historians believe that it lost its position in classical music from about the end of the 18th Century because of the eventual emergence of the sarod, an unfretted lute which evolved out of the Afghani or Kabuli rabaab and, being considered much more suitable for the Indian classical repertoire, soon became one of the top string instruments of North India. 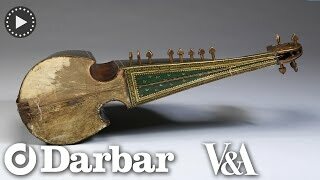 But it is more likely that the senia rabaab lost out eventually to the sursringar, (a composite instrument combining veena and rabaab) which appeared in the very early years of the 19th Century and had been designed specifically to overcome some of the limitations of the rabaab, particularly in the slow, alap (pulse-free introduction) sections of a raag recital. Many former rabaabiyas (exponents of rabaab) took up the sursringar and it was equally well received by classical music audiences. Considered to be quite close to the human voice and hence quite suitable as accompaniment for devotional songs, the instrument gradually came to be associated only with the Sikhs of the Punjab region of India. The rabaab remained a staple of Gurmat Sangeet, (Sikh Devotional Music) until about the early 20th Century after which it started to become rarer with the harmonium taking its place as the preferred melodic accompaniment for this kind of music. Currently there are several efforts to revive the tradition, notably by the Namdhari sect of Sikhs. Gilded and lacquered wood; parchment, leather, gut strings and metal wire strings. Murshidabad or Varanasi, India. c. 1850. Transferred from the India Museum, London, to the South Kensington Museum (now V&A) in 1879. Bor, Joep and Bruguière, Philippe (eds. ), Gloire des princes, louange des dieux : patrimoine musical de l'Hindoustan du XIVe au XXe siècle (Paris : Musée de la musique : Réunion des musées nationaux, 2003), cat. no. 133, p. 220. Although there are currently hardly any players – leave alone maestros – of the rabaab, one particular musical genius of the late 19th and early 20th Century was probably the last of high-profile Indian musicians to have played the instrument. Affectionately addressed as “Baba” Allauddin Khan, (c.1862 – 1972), and better known for having trained two of the world’s most famous Indian musicians, Ravi Shankar (sitar) and his own son, Ali Akbar Khan (sarod), Allauddin Khan was also an expert on the rabaab – as he was on two dozen or so other instruments, including the western violin. He was not from a family of hereditary musicians although music was played in his family for pure enjoyment. Initially trained as a vocalist, Khan is said to have been devastated when his teacher died suddenly. 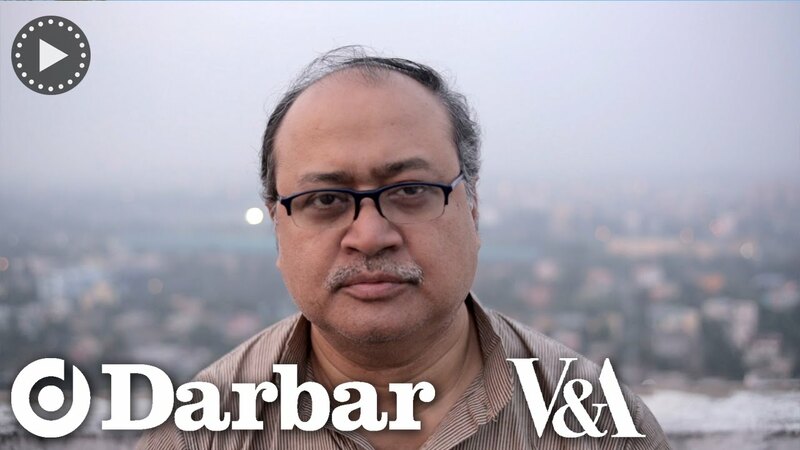 After a period of depression, and vowing to never sing again, he turned his attention to various instruments, initially getting drawn to the rudra veena (India’s oldest instrument) as well as the surbahar, (bass sitar) and eventually to the sarod. Some excerpts of recordings dating from the 1930s, of Allauddin Khan playing other rare instruments, (like the Sursringar, a rare, composite instrument combining two different kinds of veena with the rabaab,) have survived in the archives of All India Radio, and although he is reported to have also played the rabaab in the senia (dhrupad-style) for some radio sessions, the recordings appear to not have been preserved. 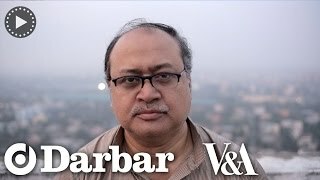 Although now an extremely rare instrument in Indian classical music, a few lesser-known players have tried to revive the rabaab with some limited success. More recently, the rabaab has been re-emerging mainly as melodic accompaniment for the devotional music of the Sikhs, given its historical associations with Guru Nanak, the founder of the Sikh religion. A number of schools, associated with Sikh spiritual communities have opened around the world while there also appears to be a growing demand for on-line resources and tutorials for learning to play the instrument. In Kashmir as well as Pakistan, the rabaab is more widespread than in India, at least as a folk instrument, but it is more usual to encounter it in the Kabuli (or Afghan) style rather than the Indian classical senia version of the instrument. Of contemporary Indian classical maestros there are no towering figures but a number of recordings and video performances are available on Youtube, notably, that of Atish Mukhopadhyay as well as Somjit Dasgupta, both of whom play the instrument in a specific dhrupad style, (the ancient vocal genre that is devoid of ornamentation), the preferred style of Allauddin Khan.